Detroit, Michigan. A group of men have hijacked a truck and are unloading their stolen goods into a warehouse, unaware that they are being watched from the shadows. The vigilante known as Kill-Cat leaps down into action and fights his way through the criminals who all realize that they have been betrayed by their employer. The Gossip always tips off the authorities with his schemes and he is soon forced to surrender by Kill-Cat. He makes a comment about Kill-Cat’s former occasional partner Dart which causes the Gossip to be left unconscious for the police. A week later, Dart is training in the Freak Force headquarters and mentions to Rapture about Chicago being overrun with super-freaks. She has been doing some research and although there have been sporadic outbreaks of super-powered people in other cities, nowhere compares to Chicago. Dart is convinced that something is causing the citizens of Chicago to gain powers. Rapture heads off and sees that Horridus is watching the world go by outside their base. She notices people with superhuman abilities are moving in across the street. Ricochet goes for a run with her boyfriend and brings up the subject about coming clean to Freak Force about their troubled past. Barbaric suggests that perhaps they should simply just move away again but this is not an option as far as Ricochet is concerned. She is happy with Freak Force and runs away from Barbaric in a state of distress. The young couple are closely watched by the Inhabiter who is then approached by Chelsea Nirvana about forming an alliance. After arriving in Chicago, Kill-Cat breaks into Freak Force’s headquarters through the roof entrance but is caught up in its security systems. Barbaric grabs hold of the intruder and throws him further into the building, annoying Rapture for reacting like that. 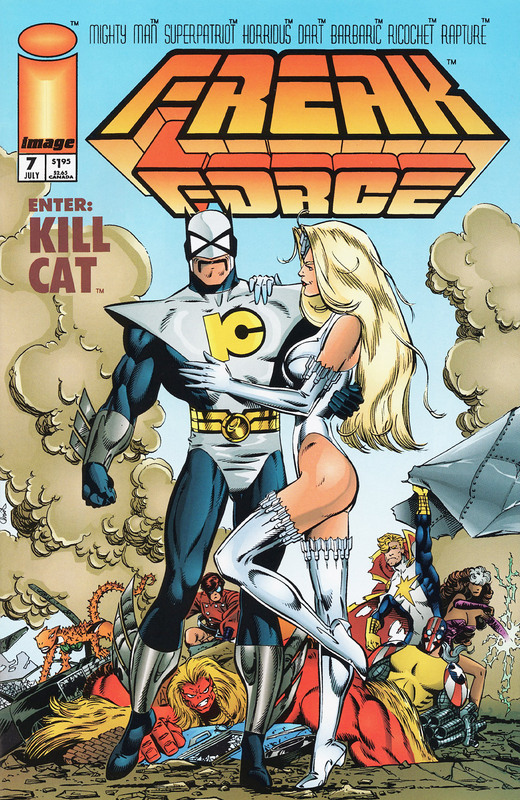 Kill-Cat is confronted by SuperPatriot but kicks his opponent through a wall into a room where Ann Stevens had been sleeping. She transforms into Mighty Man but her attack is dodged and the hero takes out Barbaric by accident. Ricochet bounces into action to knock Kill-Cat down to the ground but by this time Dart has reached the scene and she asks her teammates to stand down. Dart is embarrassed to admit that she knows their intruder before going to speak to SuperPatriot in private. Kill-Cat interrupts and makes a comment to hint Dart and he used to be romantically involved. SuperPatriot excuses himself to leave the pair alone, his sense of humor being seen by Rapture for the first time.